Buffon won 19 titles at Juve, including both the Serie A and Italian Cup crowns in his final season. 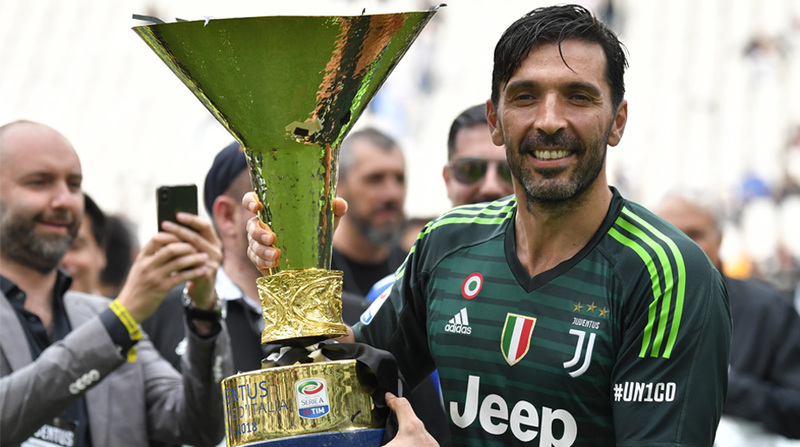 Juventus’ iconic Italian goalkeeper Gianluigi Buffon played his last game with the Serie A champions on Saturday, defeating the already relegated Hellas Verona 2-1. Buffon, 40, announced on Thursday that he is to leave the club after 17 years, and during the match, fans held a giant photo of him with the Scudetto shield awarded to the Serie A champion, reports Efe. The Juventus captain started the game, playing for 63 minutes before being replaced to the sounds of a long standing ovation from fans, his teammates and Verona’s players while leaving the field. In Saturday’s match, Daniele Rugani got Juventus on the scoreboard in the 50th minute, while Miralem Pjanic doubled the score from a set piece two minutes later. Verona managed to narrow the gap in the 76th minute thanks to former Atletico Madrid player Alessio Cerci. Juventus wraps up the league season with 95 points, seven ahead of Napoli, which is set to take on Crotone on Sunday.